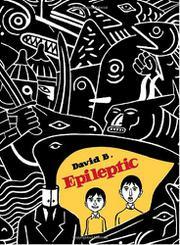 Fantastical, gloriously illustrated graphic memoir of the French cartoonist’s life, overshadowed by an epileptic brother. Born Pierre-François Beauchard, David B., a founding member of the avant-garde cartoonist group L’Association, grew up in a small town near Orleans during the 1960s, the son of two open-minded educators. His older brother, Jean-Christophe, began having severe seizures at an early age, and the disease gradually consumed the family. B.’s parents eventually lost faith in traditional doctors, who treated their ailing son more like a test case than a human being, and moved on to alternative cures. Many of them worked at first but became progressively less effective; treatment for Jean-Christophe turned into a revolving door of one guru after another. The family shuttled up to Paris to see acupuncturists and spent time in a macrobiotic commune that quickly became ugly and fascistic. Meanwhile, David increasingly retreated into a rich interior private universe to escape the reality an incurable sickness. He spun his intricate fantasies of war, monsters and shadowy conspiracies into elaborate drawings, which flow through the pages of this magnificent volume. Fantastic beasts and dark winds lurk around the peripheries of the real events being depicted and often come leaping right through them. Lost in his tales of golems, birdmen and dancing skeletons, David shielded himself from his brother’s desperate condition: “My armor is the night.” This masterful work of graphic art also succeeds as a tender yet unabashedly realistic view of the disease that eventually claimed Jean-Christophe. The boy was undoubtedly a victim, but he didn’t do the little that he could to help himself and couldn’t help but drag the rest of the family down with him. This context makes the rage that David and the rest of the family felt toward Jean-Christophe entirely understandable, though no less disturbing. An unromantic, heartrending tale, wrapped in a cloak of nightmares.